Let’s not cut any corners here. I was excited during the summer of 2010 when the Bulls made a splash to sign Utah PF Carlos Boozer to a 5-year $75 million contract. No we didn’t get LeBron (I didn’t want him, and it had nothing to do with his skill, he is the best but I want to beat him not join him) and we didn’t get Bosh, the best PF available. We weren’t trading for Carmelo and we didn’t need any of the big name PG’s that were rumored to be available in the coming year+. I’ll be the first to tell you though…I didn’t know a lot about basketball at the time and what I knew about Carlos Boozer came from Chicago news outlets and YouTube highlight videos. I quickly became an ardent Boozer hater almost immediately because of his salary and the fact that he wasn’t dominating the competition at his position the way a $15 million/year man should. He put up a 17.5/9.6 season with 51% shooting but never looked dominant and looked lazy on the defensive end. My unbridled vitriol of Boozer grew over the first season and even more in his second season in Chicago. I wanted him amnestied immediately and I wanted the Bulls to go after another star or just give the job to Taj Gibson no questions asked. Then Derrick Rose went down in the 2012 playoffs and all hell broke loose. Even the most optimistic Bulls fans projected an 8th seed and a .500 season out of our beloved Bulls in the 2012/13 season. The entire bench was blown up and several 1-year contracts were signed because the Bulls didn’t want to handcuff themselves for future years. @MisterCBooz Long overdue because I've been thinking this for awhile…I used to be an ardent Boozer hater, I WAS WRONG, I'm SORRY C BOOZ! Yes, you read that right, and those that know me may be surprised. I’m sorry Carlos Boozer, we were all looking for someone to put our frustrations on (does the fan of a team that goes 62-20 and 50-16 really have a reason to be frustrated?). Is Boozer playing up to the level of a $15 million dollar man? Maybe not, but we could be getting much worse out of a starting PF in the NBA. You’re almost to the part where I tell you why exactly I’m not upset, but let’s get to where I think Boozer deserves to be ranked with regard to PFs in the NBA. I got into a bit of a dust up with Soon-to-be-doctor Danny over this because of trying to classify certain players as centers or power forwards. I would like to consider Pau as a center, but he plays the 4, so I will put him there and I am considering Al Horford and DeMarcus Cousins as centers even if they could play the 4 without trouble. Finally, if you want to throw Carmelo Anthony and LeBron James into the 4 because of their recent play I wouldn’t blame you, but I am taking them out because of their very nebulous play. Who is surely and without argument ahead of Carlos Boozer at the 4 in the NBA RIGHT NOW? Kevin Love, LaMarcus Aldridge, Blake Griffin, Pau Gasol, David Lee, Tim Duncan and Serge Ibaka. That is 7 players that I believe Boozer has no argument to be ahead of. Josh Smith, Paul Millsap and Zach Randolph are all players that I think can be argued against, often coming out in favor of Boozer. You want to know why I think that? Well let’s kill 2 birds with one stone and compare Boozer to these three players and that will tell you both where he ranks in the NBA and why I am sorry for being such a big Boozer hater over the last 2.5 years. Boozer has a very defined range on the court with that slight fade-away, high release shot that he has mastered. Once Boozer gets out past about 18 feet, Boozer’s shot becomes…unreliable to say the least. But as you can see in the chart above, Boozer is taking a much higher percentage of his shots AT the basket compared to last season (as seen below). 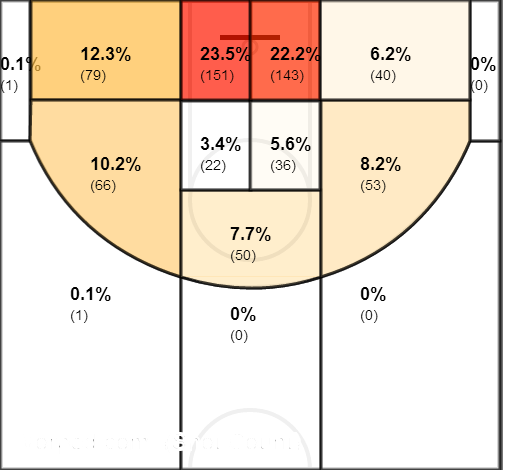 You can see for yourself, Boozer has cut down on the high release, fade-away jumper that he loves so much to the tune of 5% more shots at the basket and 5% less at the top of the key. That may not sound like much, but when Boozer is shooting 62% at the basket, compared to 45% at the top of the key, 41 more shots at the basket is a good amount of points and more importantly, makes for a much more efficient player. The high release, fade-away jumper from 15-ish feet out is the worst shot a power forward can take when it isn’t designed or a late shot-clock shot. The reason for that is because Boozer is such a great rebounder and that 15 foot fade-away not only takes him away from the basket for a rebound, his momentum is away from the basket as well so he almost certainly won’t be getting a break toward the ball for an offensive rebound. Now that he has started to make better decisions with his shots, much like LeBron taking significantly less 3’s and more low post shots, he is helping the team a lot more. Comparing Boozer to Josh Smith seems to be sacrilege on the face of it, but let’s look at it again. Josh Smith is an inefficient head case of a power forward that has an irrational love with his jump shot. He is supremely athletic and is only 27 years old and trying to command a max contract, Boozer was 28 when he signed with the Bulls mind you. Boozer’s game has always been more acceptable of a longer contract because he plays an “old man’s” game, whereas Josh Smith relies on his athleticism to make up for his poor shot selection. Boozer is taking 45.7% of his shots at the rim and Smith is shooting just 43.6% at the rim on almost 100 more shots on the season. Boozer is also having an “off-year” and only shooting 47.5% while Smith is shooting only 45.1%. These percentages do seem small, but remember that every shot is a wasted possession if it doesn’t convert to points. Finally Boozer is averaging 15.8 PTS/9.3 RBS/2.0 AST/0.7 STL/0.4 BLK on 47.5% FG and 71.2% FT. Smith is averaging a 16.9 PTS/8.5 RBS/4.0 AST/1.3 STL/2.2 BLK line with 45.1% FG, 32.4% from 3 and and abysmal 50.8% FT. When looking at the raw numbers, Josh Smith is definitely more explosive and plays better defense. But, Boozer is a surprisingly better rebounder, with more excellent rebounders playing around him, and a more efficient player, 15.7 FGA for Smith vs. 14.1 FGA for Boozer. I will concede though, Josh Smith is the better player at the moment and going forward because of his age, but did you expect it to be this close? I didn’t and I’m very happy how close it is. Now that the Boozer side of this has been laid out, comparing him to Millsap and Randolph will be much easier and, don’t worry, faster. Paul Millsap is the man who Boozer left the Utah Jazz with as his replacement and has played up to a level similar to Boozer. Quickly, Millsap’s numbers; 14.9 PTS/7.3 RBS/2.5 AST/1.3 STL/1.1 BLK with 48.4% FG/36.4% 3P (surprisingly)/74.4% FT. Boozer is anything but a stretch 4 and intelligently doesn’t try to be, unlike Josh Smith. However, Paul Millsap is hitting a decent percent from three, but that is likely due to his shot selection being much better, only taking 0.6 per game. Again, we see that Millsap’s steals and blocks show that Millsap, age 28, has much faster hands and more athleticism. Their similar assist numbers lead me to believe that their interior passing is comparable, but having watched them both I believe that Boozer’s passing acumen with Noah is one of the best in the league. 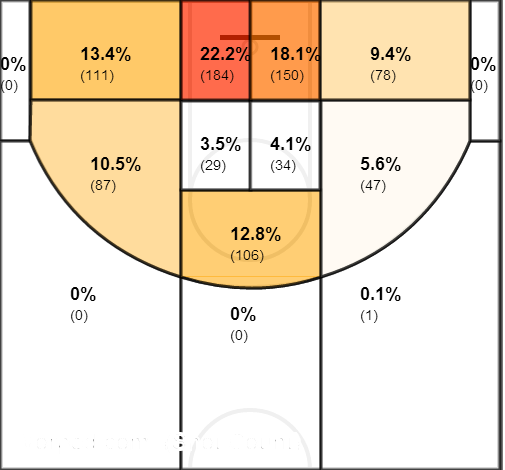 Millsap scores less, but it is more efficient with less shots per game, 11.4. The rebounding rate is what really piques my interest, Millsap’s advantage in athleticism should show up in the rebounding, but much like Josh Smith, Boozer gets more rebounds with better rebounders around him. This time, I think it is basically a toss-up but I am giving it to Boozer based on his ability to rebound and that he is 4th in the NBA in double-doubles at the PF position with 24 and Millsap only has 11. Boozer’s ability to get to the basket and play a smart game also helps me give him the nod over Millsap who has more athleticism to use but isn’t utilizing it to the same level that Boozer does with his ability. This is getting long, I know, but there is just one more comparison to make, Boozer with Zach Randolph, the man who all of the talking heads and half time analyzers praise for his on the court production and is seen as a top PF that should make the All-Star game (spoiler alert, he made it as a reserve). First, Randolph is second in double-doubles in the NBA at 30 on the season and he outpaces Boozer on the boards at an 11.6 RBS/game clip. However, Boozer plays next to a center in Noah that is averaging 11.2 per game and Randolph plays with Marc Gasol, who is averaging just 7.7 per game. To me, that shows that Boozer is working harder for his 9.3 than Z-Bo is working for his 11.6. Take a quick look at Randolph’s full line on the season though, 15.7 PTS/11.6 RBS/1.5 AST/0.9 STL/0.5 BLK on 47.3% FG/11.1% from 3 with 0.4 3PA per game/76.0% FT. Randolph has very similar downside based on his defense over the years and it shows up in the numbers where he averages similar stats to Boozer on the defensive end. Boozer seems to have better help defense on the floor, even if he has slow feet, he gets those feet in the right place much better than Z-Bo does. Oh…by the way, Randolph makes $16.5 million this season, which is more than Boozer makes, and he isn’t brought up often as over-paid. Do those two lines look different enough that Carlos Boozer has become the subject of so much hatred to his fan base and Zach Randolph is being touted as a deserving All-Star? He shoots more of his shots at the rim, 58.4%, than Boozer does, but still scores less per game than Boozer with his 13.8 FGA/game. I look at these two as carbon copies of each other, but based on Boozer’s help defense and interior passing, I would take Boozer over the “All-Star” every single time. Depending on how you feel about my breakdown, that puts Boozer somewhere between the 8th best and 10th best PF in the NBA, no small feat. If you’re still here reading this, thank you, and if you’re a Chicago Bulls fan, take a moment and reconsider how you feel about Boozer. Every fan base latches onto someone to blame for any perceived weakness of the team, and the highest paid player that isn’t the star of the team is generally chosen. Remember how everyone felt about Luol Deng just a few short years ago? That is exactly what Boozer is, a highly paid player that isn’t producing up to the level that he is making, but that is what happens in the free agent market, you get the player at market value, not at production value. Boozer has performed admirably in the absence of Derrick Rose and has turned me into a believer in him and this team as a whole. If we trade him for a player of Bargnani’s ilk, I would be disappointed beyond belief because a player that fights for rebounds like Boozer (Bargnani is 7’0″ tall and averages under 5 rebounds per game) is much more valuable than a 35% 3 point shooter at his best that is afraid of contact. Boozer gets down and does the dirty work with Joakim Noah. If you’ve ever watched a Bulls game, you know that Boozer is also the man who talks…a lot. He lets the refs know how he feels, which probably negatively impacts the amount of calls he gets personally, but definitely helps keep the refs honest to the team as a whole. One more time and join me if you want…I’m sorry Boozer, I have under-appreciated you for years and I am taking back those sentiments. Thank you for how you’ve worked as a Bull and I hope you’re here to enjoy our first championship since MJ. You’ve turned me and I hope anyone else that reads this into a Boozer fan.